By Keith Cowing on July 28, 2017 8:12 PM. "Even Trump's space policy adviser for his campaign and transition says getting a man or woman on the face of Mars by 2024 is virtually impossible. "I don't think you'll get there [to Mars]," former Pennsylvania Rep. Bob Walker said in an interview about the possibilities under the Trump White House. "I do think that we will probably have a flight to the moon, an Apollo 8-type flight where you go up and go around the moon in a fairly short period of time." 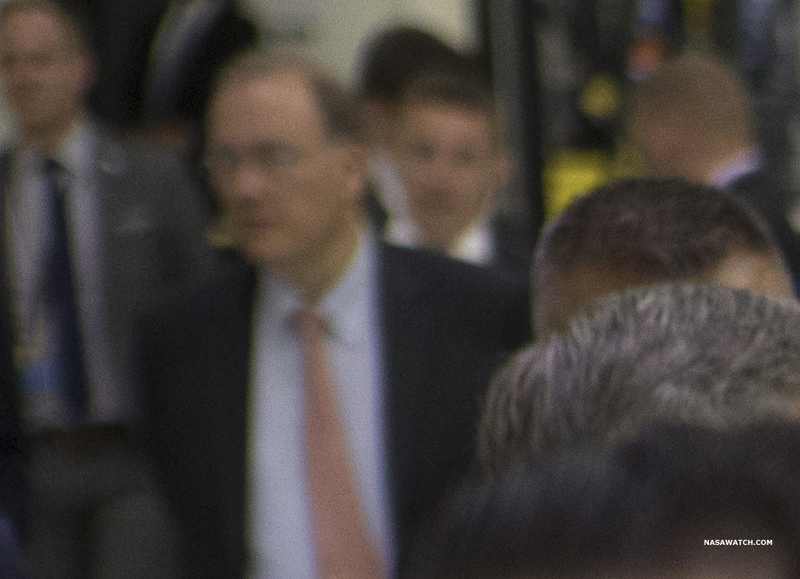 A NASA official who served under former President Barack Obama shared Walker's prediction. "I think things could go very well for going to the moon, which I think is more likely to be a Trump agenda," said Lori Garver, Obama's deputy NASA administrator. During his first six months in office, Trump has laid out an ambitious -- if non-specific -- space agenda." "National Aeronautic Space Administration (NASA or Deep Space Exploration Administration or DSEA) -Aside from the fact this is based very heavily in science, there is also a large cry to reduce their $105.5b budget and even movements to roll our space program into DSEA. With the help of, and to the credit of, the administration there can be drastic cost cuttings for big wins for the administration." By Keith Cowing on July 28, 2017 12:57 PM. "NASA determined it was feasible to fly crew on EM-1. However, in the balancing of the cost, schedule, and technical risks, and the fact this is a long-term exploration program, it was determined that the current baseline program was the better long-term solution. The study was beneficial and has improved NASA's overall planning for SLS, Orion, and ground systems. Given the decision not to fly crew on EM-1, NASA continues working toward an uncrewed first flight as the first mission in a series of deep space missions beyond the Moon in preparation for sending humans to Mars in the 2030s." "NASA wants people to know it could have done this, if they had the money, but won't because they don't," Keith Cowing of NASAWatch told BuzzFeed News. "It does kind of beg the question of why they weren't doing it this way all along if it was such a great idea." By Marc Boucher on July 27, 2017 1:02 PM. "Moon Express has raised $45 million(US), built hardware, tested some of it, and gotten the FAA and other government agencies to approve of its first commercial mission to the moon, and in less than a year might have its first spacecraft on the moon." "In this episode of the SpaceQ podcast Bob Richards, CEO and co-founder of Moon Express talks about the latest news from the company, including how lunar samples they return could be worth tens of millions, possibly even hundreds of millions. If true, and if Moon Express can return those samples, then an important part of their business plan will have been accomplished and a new commercial frontier will have been opened up." By Keith Cowing on July 26, 2017 4:10 PM. #NASA says "GISS websites may be unavailable due to network reconfiguration"
By Keith Cowing on July 26, 2017 10:46 AM. "Breakthrough Starshot, a multi-faceted program to develop and launch practical interstellar space missions, successfully flew its first spacecraft -- the smallest ever launched. On June 23, a number of prototype "Sprites" - the world's smallest fully functional space probes, built on a single circuit board -- achieved Low Earth Orbit, piggybacking on OHB System AG's 'Max Valier' and 'Venta' satellites. The 3.5-by-3.5 centimeter chips weigh just four grams but contain solar panels, computers, sensors, and radios. 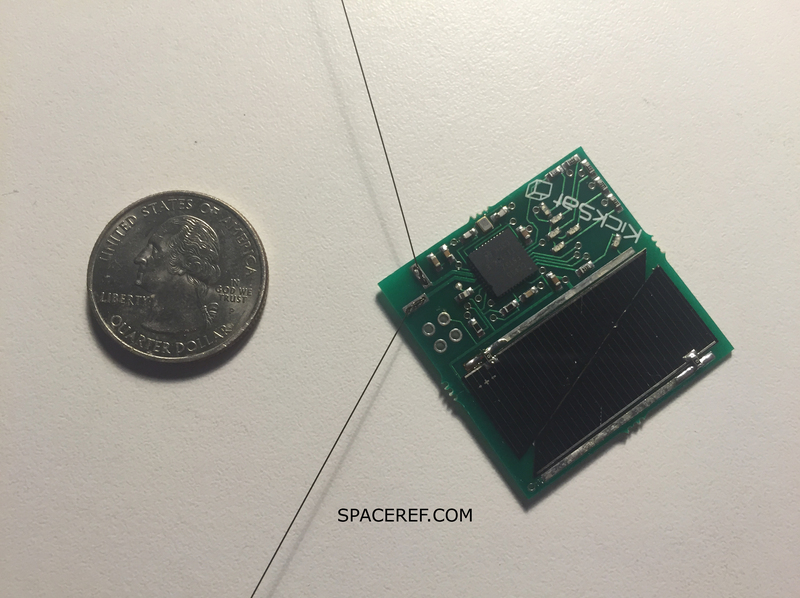 These vehicles are the next step of a revolution in spacecraft miniaturization that can contribute to the development of centimeter- and gram-scale "StarChips" envisioned by the Breakthrough Starshot project." By Keith Cowing on July 24, 2017 6:14 PM. There is a disturbance in the Force with regard to pending #NASA leadership choices. 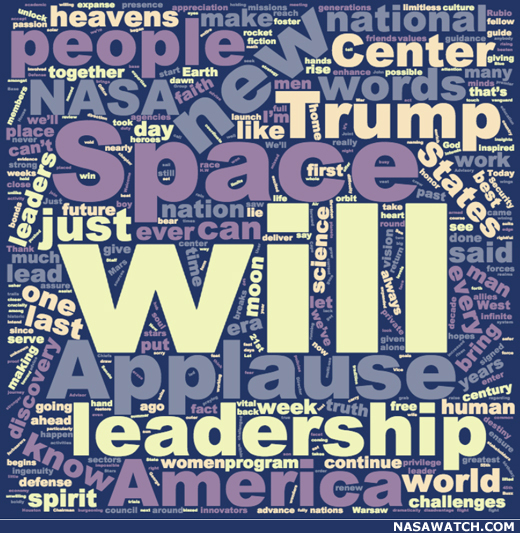 Latest #NASA Administrator chatter: Bridenstine fading, Lightfoot rising. Commercial Crew Flights in 2018? By Keith Cowing on July 20, 2017 8:11 PM. "The next generation of American spacecraft and rockets that will launch astronauts to the International Space Station are nearing the final stages of development and evaluation. To meet NASA's requirements, the commercial providers must demonstrate that their systems are ready to begin regular flights to the space station. Two of those demonstrations are uncrewed flight tests, known as Orbital Flight Test for Boeing, and Demonstration Mission 1 for SpaceX. After the uncrewed flight tests, both companies will execute a flight test with crew prior to being certified by NASA for crew rotation mission. The following schedule reflects the most recent publicly-releasable dates for both providers." By Keith Cowing on July 20, 2017 9:54 AM. "Executive Summary: The second fiscal quarter (Q2) of 2017 (FY17) brought forward meaningful progress for the International Space Station (ISS) U.S. National Laboratory and demonstrated signals of opportunity for future space science platforms. From a big picture perspective, key developments in commercial space outside of the ISS National Lab are noteworthy for our stakeholder community. 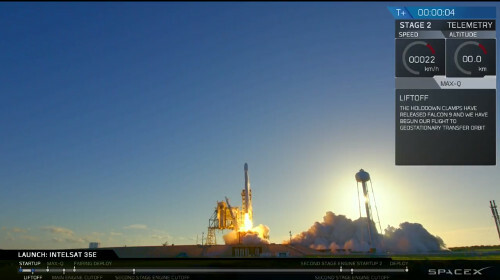 In March, SpaceX achieved a historic milestone on the road to reusability in space transportation with the world's first reflight of an orbital class rocket. This achievement in reusability signals the tangible progress that the industry is making toward lowering the cost of transportation, a well-established barrier for space research and development. In addition to this milestone, commercial companies publicly announced this quarter intent to develop standalone, privately funded space stations within the decade. Finally, Congress' actions to pass the NASA Transition Authorization Act of 2017 provide a firm foundation for continuity of progress toward America's leadership in commercial space. These developments are encouraging to both traditional and nontraditional users of the ISS National Lab as our nation looks to develop long-term research initiatives in space. Adding to this renewed excitement in commercial space, momentum with space research development on the ISS National Lab continues to accelerate and expand." Keith's note: What's really bizarre is that CASIS is feeding this overt NASA PR hype back to NASA as part of a quarterly report to its (sole) customer. As if NASA had not already read its own hype without the need for CASIS to regurgitate it as part of a contract deliverable. Or maybe CASIS is just trying to make NASA feel better and simultaneously inflate its on value by aligning itself with the NASA spin machine. Hard to tell. Maybe they hope the new White House staff are reading these things. 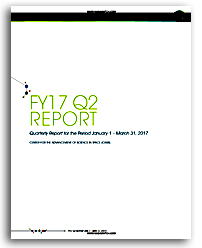 There's actually a lot of really important updates in these quarterly reports (more to follow) that are worthy of wider dissemination. Valuable research is being accomplished on the ISS. I am just baffled as to why CASIS feels the need to puff it all up with hype. Oh yes: the CASIS website visitor target for FY 2017 is 129,000. That's pathetically small. NASA.gov blasts that out every second. Indeed, the website you are reading does that traffic in a matter of days. CASIS also seeks to have 114,000 Twitter followers by the end of FY 2017. By comparison @NASAWatch and @spaceRef have more than 110,000 followers. Other space websites have many more followers. Indeed @NASA has nearly 25,000,000 followers. At yesterday's ISS R&D Conference (sponsored by CASIS) everyone was moaning about how the public does not know what the ISS is doing. With such a tiny web presence CASIS is certainly not doing much to alleviate this situation. By Marc Boucher on July 19, 2017 2:38 PM. "The Center for the Advancement of Science in Space (CASIS) today announced a cotton sustainability challenge, sponsored by Target Corporation, where researchers and innovators will have the ability to propose solutions to improve crop production on Earth by sending their concepts to the International Space Station (ISS) U.S. National Laboratory. The challenge will leverage a broad range of disciplines to find breakthrough solutions that can be implemented affordably and benefit the cotton production community." By Keith Cowing on July 18, 2017 8:14 AM. "The president had an opportunity after challenging NASA to show how we could put humans on the very first flight of SLS and Orion," Bolden said. He referred to the Trump administration's early request that NASA consider a crew on the first launch of the Space Launch System under development. NASA said, "It can be done, but it's got a healthy price tag, so we think we ought to stick with the plan we have now...," Bolden said. "The president could have very easily said, 'No, I want to do what I said.' We're going to put a crew on it. Go for it. I'm going to work with Congress and we're going to give you the money to do it.' That's the way we did Apollo." Keith's note: Gee, if this crew on EM-1 thing was such a big deal for Bolden why didn't he say something like this at some point during his 8 years at NASA? Now it just sounds like sour grapes from the sidelines. By Keith Cowing on July 16, 2017 8:07 PM. By Keith Cowing on July 14, 2017 12:00 AM. "Over his career, Dr. Scott Pace has honed his expertise in the areas of science, space, and technology. Currently, he is the Director of the Space Policy Institute and Professor of the Practice of International Affairs at George Washington University. Dr. Pace also serves as the Vice-Chair of the National Oceanic and Atmospheric Administration's (NOAA) Advisory Committee on Commercial Remote Sensing (ACCRES). Previously, he served at NASA, the White House Office of Science and Technology (OSTP), and the RAND Corporation's Science and Technology Policy Institute (STPI)." "Take a close look at the upper left hand portion of this image taken at NASA KSC today of Vice President Pence and his entourage. There is one person who (from a distance) sure looks a lot like Scott Pace." By Marc Boucher on July 13, 2017 1:49 PM. "In 2016 Jim Cantrell and group of veteran space professionals started Vector Space Systems. Their goal? Nothing less than than building a small satellite launch company capable of launching upwards of 100 small satellites a year from at least three spaceports." Note: Vector received some initial grant money from NASA. "According to Euroconsult's latest report, Prospects for the Small Satellite Market, significant expansion in terms of capabilities and demand is underway in the smallsat market. Over 6,200 smallsats are expected to be launched over the next ten years, a substantial augmentation over that of the previous decade (several mega constellations are now included within the scope of this report). The smallsat market from 2017-2026 will be driven by the roll-out of multiple constellations accounting for more than 70% of this total, mainly for commercial operators." "The total market value of these smallsats could reach $30.1 billion in the next ten years, up from $8.9 billion over the previous decade." By Keith Cowing on July 13, 2017 12:39 PM. "Now, finally, the agency appears to have bended toward reality. During a propulsion meeting of the American Institute for Aeronautics and Astronautics on Wednesday, NASA's chief of human spaceflight acknowledged that the agency doesn't really have the funding it needs to reach Mars with the SLS rocket and Orion spacecraft. These vehicles have cost too much to build, and too much to fly, and therefore NASA hasn't been able to begin designing vehicles to land on Mars or ascend from the surface. "I can't put a date on humans on Mars, and the reason really is the other piece is, at the budget levels we described, this roughly 2 percent increase, we don't have the surface systems available for Mars," said NASA's William H. Gerstenmaier, responding to a question about when NASA will send humans to the surface of Mars. "And that entry, descent and landing is a huge challenge for us for Mars." "And of course none of these Mars missions in the 2030s are in any budget - notional, proposed, or projected - that means anything to anyone actually working at NASA today. So it is hard to blame people who can't give you a straight answer. Just look at what their management has given them to work with - and what the agency has had to work with in terms of guidance from Congress and the White House. Just in the past 10-12 years NASA has veered away from the shuttle towards the Moon, then away from the ISS to Mars and away from the Moon and back to ISS, and now back to Mars (and maybe the Moon) and also some boulder on an asteroid." By Keith Cowing on July 12, 2017 1:19 PM. "On July 12, 2017, Moon Express unveiled its exploration architecture, including plans to establish the world's first permanent lunar outpost at the South Pole of the Moon by 2020. The company's robotic explorers are flexible, scalable platforms that will help reopen the American frontier on the Moon, conduct prospecting and sample return operations, and support lunar science, exploration and commerce." By Keith Cowing on July 12, 2017 11:41 AM. "NASA's Juno mission completed a close flyby of Jupiter and its Great Red Spot on July 10, during its sixth science orbit. All of Juno's science instruments and the spacecraft's JunoCam were operating during the flyby, collecting data that are now being returned to Earth. Juno's next close flyby of Jupiter will occur on Sept. 1. Raw images from the spacecraft's latest flyby will be posted in coming days." Keith's note: The first raw #images of Juno's flyover of Jupiter's great red spot have been posted online. By Keith Cowing on July 7, 2017 3:26 PM. 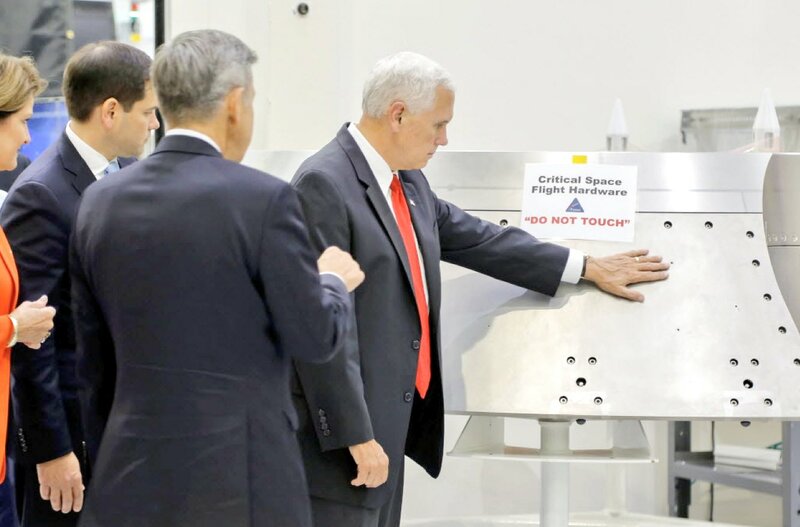 Keith's update: Official NASA response to the Pence "Do Not Touch" Photo: "The 'do not touch' signs are there as a day-to-day reminder, including the one visible on the titanium Forward Bay Cover for the Orion spacecraft. Procedures require the hardware to be cleaned before tiles are bonded to the spacecraft, so touching the surface is okay. Otherwise, the hardware would have had a protective cover over it like the thermal heat shield, which was nearby." So in other words "do not touch" means "you can touch". Only at NASA. Keith's note: Unlike some aspects of this White House Vice President Pence has a sense of humor. Well played. Keith's note: KSC Director Bob Cabana had one thing to do during the walk through ... Larger view. By Keith Cowing on July 6, 2017 8:21 PM. Keith's note: Take a close look at the upper left hand portion of this image taken at NASA KSC today of Vice President Pence and his entourage. There is one person who (from a distance) sure looks a lot like Scott Pace. 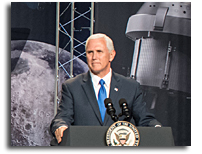 Pace is widely expected to be named as executive secretary of the newly re-chartered National Space Council - and Pence made frequent mention of the Council in his remarks today. Just sayin' [Enlargement]. Keith's update: Yes, that is indeed Scott Pace. By Keith Cowing on July 6, 2017 4:10 PM. 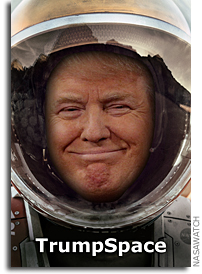 "And I bring greetings from the man who is going to make that happen, his admiration for all of you gathered here and for America's storied history in space is boundless; and he is committed each and every day to American leadership at home, around the world, and in the boundless expanse of space, the 45th President of the United States of America, President Donald Trump. (Applause.)" Keith's note: Just doing a simple word count shows that "America" appears 68 times. "Will" = 54. "Lead" = 33. "Space" = 73. "President" = 40 "(applause)" = 23. And so on. 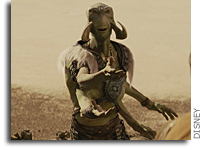 The speech was clearly designed to say that America will lead in space due to the President leading (applause). By Keith Cowing on July 6, 2017 1:47 PM. By Marc Boucher on July 5, 2017 7:43 PM. By Keith Cowing on July 3, 2017 1:17 PM. "Until now, no single craft has visited the ISS and returned to Earth more than once. In fact, all other non-SpaceX vehicles that visit the space station are designed to burn up in the atmosphere after a single flight. SpaceX has been recovering its Dragon capsules via splashdowns in the ocean, but this is the first time that one of those recycled craft has completed a second re-supply mission." Good point! Looks like some key words were missing from the CNET story. We've fixed. Thanks for pointing out! !